Doorbell cameras are handy little devices that can be used to get a better picture of the person at your doorstep. You will never have to open the front door again with a warning about what is on the other side. To help you find the best doorbell cameras, we researched a variety of new and best selling products. The result is the top ten doorbell camera reviews below. Now: Before we get started, here’s what you need to know when shopping. 2-Way Audio: 2-way audio is the ability to hear the person outside, and react and respond. 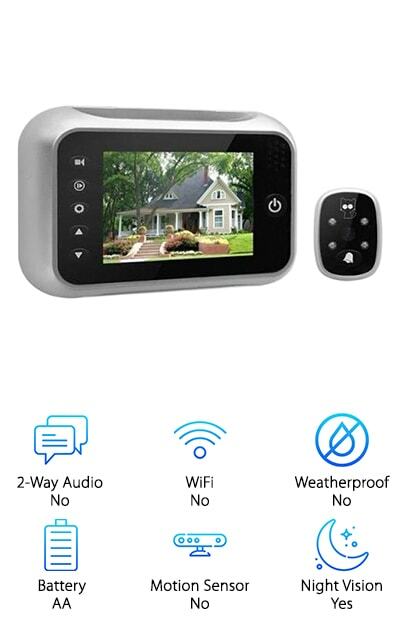 Some of our selections will actually enable you to respond wherever you have a WiFi connection to your WiFi doorbell camera. It’s a very handy asset. WiFi: WiFi, in the simplest terms, means that your front door camera system can connect to the internet in order to communicate with users. 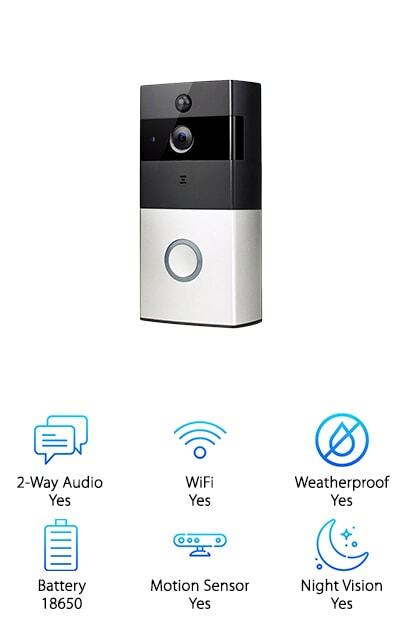 The best wireless doorbell will allow you to check in as long as you have that connection. 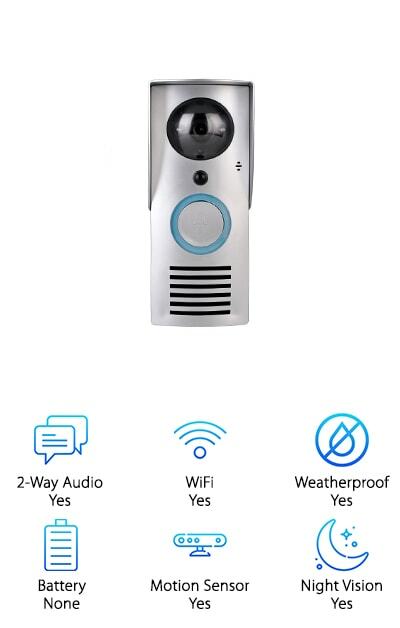 Weatherproof: Many of our top ten modern wireless doorbell choices will continue to function in inclement weather, on windy, sunny, or very cold days. That's good news for you because it means you can make use of the doorbell outside your home. Battery: The front door camera doorbell picks below run in various ways. They may hook up to existing doorbell wiring, or they require batteries. In every case, we will tell you exactly what is used so that you are prepared. Motion Sensor: A motion sensor uses heat to pick up activity on your property. Think of it as an added level of security. Even if someone does not press the wireless video doorbell, you will know that someone is there. Night Vision: LED lights are utilized to pick up late-night visitors. Night vision is a great asset for any doorbell camera since it extends its usefulness. Check to see if your wireless doorbell camera favorite includes night vision as well. Now that you know how to choose a great doorbell with a camera, let’s get right to the reviews. Here’s the deal: If you’re in a hurry, take a look at the top pick and budget pick. 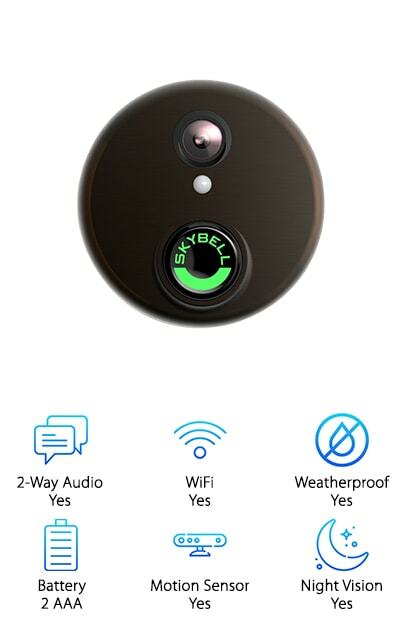 Both are fantastic products and two of the best doorbell cameras we found. Right below, you’ll find the runner-ups in our reviews. If you’re looking for the best doorbell camera, it’s on this list! Let’s get started so you can find the best one. This is the best plug-in wireless doorbell we found! 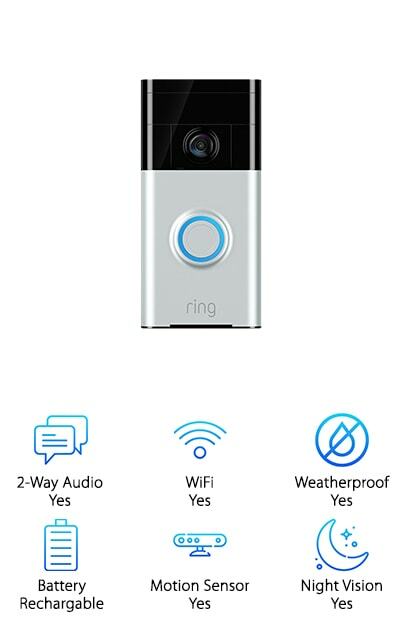 Our reviewers want you to know that the Ring Wi-Fi Enabled Video Doorbell is a top-selling item for a reason. It allows you to take care of your property with crystal-clear HD video vision. Unlike kits with multiple parts, the Ring is a single device that comes with a mounting kit and an installation guide. It will take just minutes for you to place it in the right spot on your door. Then it is time to connect. You can teach it to communicate with your smartphone or your computer, or both! Sit back, relax, and watch as it transmits information to you about each and every visitor. Whenever someone presses the doorbell, you will receive an alert and the option to speak to them and see them. If they show up at night or do not ring the bell, you have both night vision and motion sensors to assist you. Another favorite for our reviewers is the AKASO Video Doorbell. With 8 gigabytes of memory storage, you can create monitoring logs for any property. It is wireless in more ways than one since there are also no wires needed for installation. Put it up outside your doorway and sync it to a smart device. 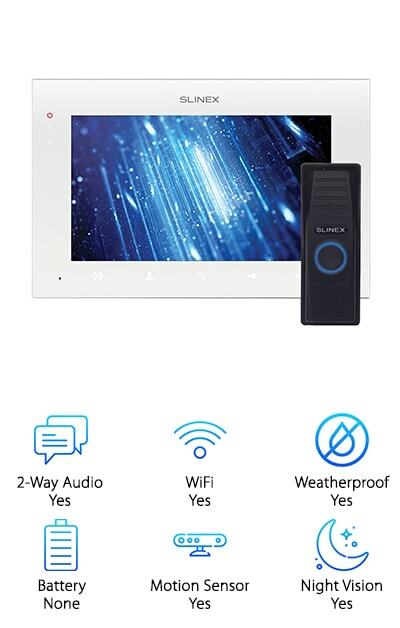 You now have a connection to your home from anywhere in the world, provided you have wireless internet. You can answer your door in the USA or anywhere else while you vacation abroad! You can also speak to whoever is there, record images and video, and keep an eye on things. The wide-angle lens offers a 166-degree view from the door. Any recorded information is stored on the SD card. That’s not all! Customize doorbell volume, motion detector sensitivity, and intercom volume. If you have budget considerations but still want to be safe, pick up an AKASO Video Doorbell immediately. It will secure your peace of mind! A good video doorbell is always on, and it doesn’t take up too much of your time for maintenance and TLC. The SkyBell HD Video Doorbell provides you with on-demand viewing when you need it most, and even when things are peaceful and quiet. Take, for example, a neighbor coming by to drop off some cookies. Even with their hands full, they will trigger the SkyBell’s motion sensor so that you immediately know someone is there. HD video and photos will both be transmitted to any registered user. 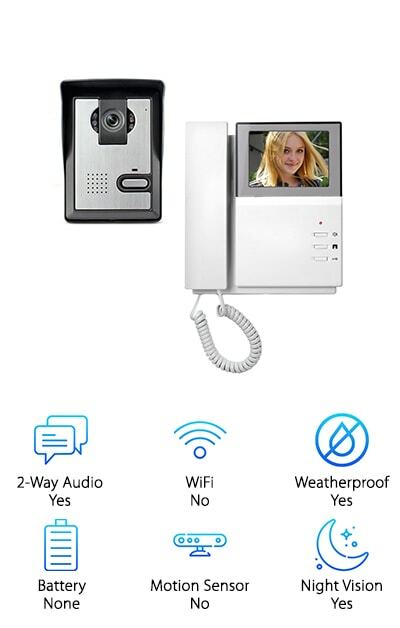 If you happen to not answer, a video will be recorded to a cloud storage device so that you have a record of every single thing that happened at your doorstep. That happens whether the motion sensor was triggered, or the doorbell was pressed. The SkyBell is weatherproof and can stand up to extreme temperatures. Solid night vision and 2-way audio mean even a midnight visit will be as clear as a bell. The Eques Greeter Doorbell is a revolutionary item that is worth having on your radar. Instead of being placed in the doorbell position on your front door, it replaces the peephole. You can think of it as an “advanced peephole,” once it gets to work. On one side, a wide-angle lens with a 165-degree view looks out onto your landing, your stoop, or your front porch. On the other side, you will mount a 2.8-inch LCD digital display screen. A bracket, charger, screws and a USB cable are included. The device runs off 1 lithium-ion battery, which is included. The battery is rechargeable, so hooking the Eques up to the provided cable is all you need to fill it up once again. You will never have to buy additional batteries. The simplicity of the Eques eliminates the need for a smartphone or a computer connection. That means it is extremely user-friendly and easy to understand for seniors and children. You can get something very affordable and functional when you choose the KungFu King Doorbell Security Camera. This is a peephole camera, and it functions without the help of any other devices like computers or smartphones. Once you receive your new doorbell, it takes the position of your old peephole in the center of your door. There, it will act as both a viewing portal and a ringer for anyone who pays you a visit. It has a number of exciting features. What are we talking about? You’ll be happy to know there are 32 ringtones to choose from. There is an optional spot for an SD card, so you can store the memory of any presence or interaction outside your door. The LCD color screen is a generous size, 3.5 inches. You will be able to view both photos and video from the safety of your own home. A “Do not disturb” function will keep everyone away when needed! Want a video doorbell that does everything on our list, and unlocks your door remotely at your command? Yes, it exists! 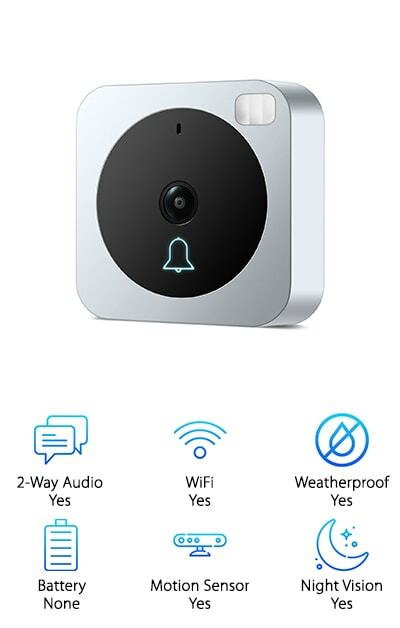 It’s called the Qooarker HD Camera Doorbell. At just 3 inches wide by 7 inches long, this is a powerhouse of capability and function. 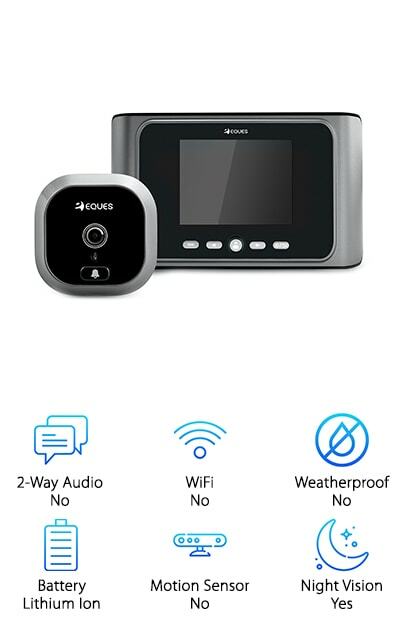 The remote unlock function is great: Since this camera is enabled to be wireless, you will get an alert that someone is at your door wherever you have an internet connection. Acknowledge that the visitor is expected, and hit the “Unlock” key to open your door to them. That’s it! This is a brilliant device for a person who is convalescing, elderly or disabled. It is also weatherproof – both waterproof and able to withstand temperatures on the extreme cold and hot ends of the scale. A motion sensor will activate when movement is sensed, and night vision will kick on in the evenings. The Qooarker is compatible with Windows and Mac, iOS and Android. Take the next step to building a smart home by acquiring a smart doorbell. The VueBell WiFi Video Doorbell is extremely smart, and it can pair with other devices like Alexa to become even more intelligent. To get the Vuebell into place, remove the existing doorbell, and then use the same wiring to put it into place. No batteries are needed here. The doorbell is a camera with an extremely wide angle – 185 degrees. Pair your doorbell with your smartphone, and you can check the view from your doorway no matter where you are. If someone has arrived and needs a response or assistance, you can speak to them and see them live. Alerts and snapshots are also provided. A multi-tone chime and a light-up LED bell will also help with providing notifications. At night, LED lights provide night vision with about 18 feet of viewing for your convenience! Motion sensors will catch anyone within 9 feet of the doorbell. The AMOCAM Video Door System is both attractive and helpful. It consists of a small video-equipped doorbell unit that goes on the outside of your door, and an indoor color screen and phone setup. The outdoor camera is water and weatherproof, and it’s easy to put into place. The durable alloy will not rust due to moisture or rain. One camera can be connected to up to four monitors. The indoor LCD monitor has a couple of truly helpful buttons. With one, you can unlock the front door. Others start the dual intercom function, so you can talk to whoever is outside, and they can respond. 16 different chimes mean you can find the one that sounds best to your ears. Night vision means you will never miss a visitor, and intruders will be caught early. This is a great option for senior citizens, and people living alone. No batteries are needed. The AMOCAM will make life easier, and safer! Have you ever heard the doorbell ring, and didn’t know if the person on the other side was a friendly guest? Have you ever wished there was an affordable way to stay safe in your own residence? Take your safety into your own hands with the Slinex Video Doorbell. Software for motion detection means the Slinex takes things a step further, by picking up anyone lurking around outside. That will provide you with peace of mind. There is also 2-way audio, so if you cannot immediately come to the door to grab a package or sign for documents, you can let the visitor know you are on your way. Anyone who rings or knocks will send an alert directly to the indoor portion of the Slinex system. Place it in your home office, your kitchen, or right inside the front door. SD memory cards with up to 32 gigabytes of storage can also be used to retain records of all visits. 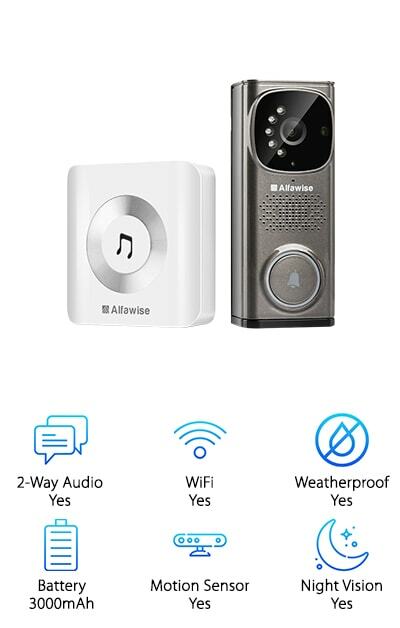 The Alfawise WiFi Camera Doorbell pairs with the Alfawise app, which can be downloaded directly to your phone. It’s very intuitive – it will play a message when you are not available. When you can respond, the Alfawise will send an alert and a recorded video clip. 2-way audio is always an option, so you don't even have to answer the door if you don't want to. Do it on your smartphone, since Android and iOS are both compatible. You have the choice of storing everything in the cloud, so all visits and visitors can be recorded, making this a wonderful security device. Using the cloud helps your doorbell get “smarter” by helping it to reduce false alerts. Here’s the scoop: You get a free trial of the cloud-storage service with purchase. The built-in lithium battery is rechargeable, so you never need to buy another battery. How easy is that? Give the gift of serenity to someone who needs to feel safe!